For other uses, see Adela (disambiguation). Not to be confused with Adelaide of Normandy, sister of William I of England. Adela was a daughter of William the Conqueror and Matilda of Flanders. She was also the mother of Stephen, King of England and Henry of Blois, Bishop of Winchester. The couple had ten children, though not all of them are known to have been Adela's biological children. It is certain only that she had five sons and might have had three or more daughters. Adela was born, it is generally believed, after her father's accession to the English throne, between 1066 and 1070. Her royal blood marked her as noble in the eyes of her peers. She was the favorite sister of King Henry I of England, and they were probably the youngest of the Conqueror's children. Adela was a high-spirited and educated woman, with a knowledge of Latin. She had three older brothers and one younger, and thus she would not inherit her father's honors, but her bloodline would be a valuable asset to any suitor. 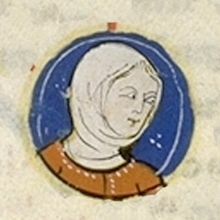 Adela married Stephen Henry, son and heir to the count of Blois, between 1080 and 1083, around her fifteenth birthday. Stephen was nearly twenty years her senior. Stephen inherited Blois, Chartres and Meaux upon his father's death in 1089, as well as lands and right in parts of Berry and Burgundy. The Thibaudian dynasty had other possessions east of Paris, and by the end of Adela's life these were coalescing into the county of Champagne. While Theobald IV takes most of the credit for the emergence of that principality, Adela helped lay its foundations. Adela and her husband had a relationship based on trust and mutual respect, if not affection, and she made decisions along with Stephen. She swore, for instance, to bind herself and her husband to protect the bishop of Chartres, then in a dispute with the king of France. Stephen-Henry joined the First Crusade in 1096, along with his brother-in-law Robert Curthose. Stephen's letters to Adela form a uniquely intimate insight into the experiences of the Crusade's leaders and show that he trusted Adela to rule as regent while he was on crusade. Adela filled in as regent for her husband's duties during his extended absence as a leader of the First Crusade (1095–1098) as well as during his second expedition in 1101. This included granting monks the right to build new churches, as well as other charters. Adela also worked with Ivo of Chartres at various points, exchanging letters throughout her regency, to discuss matters such as the control of misbehaving nuns and larger issues such as disputes about sworn oaths. While her husband was away, Adela would continue to tour their lands, settling disputes, promoting economic growth, and even commanding knights to go to battle with the king. This however was not unique, as during the crusades it was common for noble women to take upon themselves the duties of their male counterparts. The Count of Blois returned to France in 1100 bringing with him several cartloads of maps, jewels and other treasures, which he deposited at Chartres. When he abandoned the First Crusade returning to France in ignominy, Adela constantly berated him, even during their love-making, urging him to return to the Holy Land. He was under an obligation to the pope for agreements made years earlier and returned to Antioch to participate in the crusade of 1101. He was ultimately killed in an ill-advised charge at the Battle of Ramla in 1102. The image of Adela persuading her ease-loving husband to redeem his reputation through action has proved popular with historians attempting to account for the crusader motivations. Adela continued to act as regent after her husband's death and through her son Thibaud's early rule until her retirement in 1120. Even after Thibaud came of age and no longer needed a regent, Adela continued to issue charters and act as co-ruler of many parts of their land. Adela did not secure a marriage alliance for Thibaud, who did not get married until after Adela's retirement, which helped to maintain her power and influence over both her son and her lands. Adela, a devout Benedictine sympathizer, employed several high-ranking tutors to educate her children. Her youngest son, Henry, was conceived during the single year Stephen was in France between crusading duties. At two years of age Henry was pledged to the Church at Cluny Abbey, Saône-et-Loire, France, as an oblate child, that is, he was dedicated to the service of God, according to medieval practice. Henry went on to be appointed Abbot of Glastonbury and Bishop of Winchester. In that capacity, he sponsored hundreds of constructions including bridges, canals, palaces, forts, castles, and whole villages. In addition, Bishop Henry built dozens of abbeys and chapels and sponsored books including the treasured Winchester Bible. In 1105, after St Anselm visited her during a sickness, she was responsible for communicating the archbishop's earnestness in threatening excommunication to her brother Henry I. Orderic Vitalis praises her as a "wise and spirited woman" who ably governed her husband's estates and her own. Adela's power and interests are reflected in letters collected, they demonstrate her religiosity and intellect. In one such letter to the public from 1104, Adela gifts a monastery a portion of land with all the wildlife inhabiting it, but she reserves the power to pass judgment upon crimes committed in the area. She also makes sure to mark her place as a woman, tying herself to not only her late husband but her sons. Adela quarrelled with her eldest son William and despite his previously being named heir-designate, she appointed his younger brother Theobald to replace him as heir in 1107. Her son Stephen moved to London in 1111 to join his uncle's court and became the favorite of his uncle King Henry I (Beauclerc). Upon Beauclerc's death in Normandy (1135), Stephen of Blois seized the English throne. He seized the English crown from the Empress Matilda, King Henry I's daughter whom the monarch had named as his successor. This started a protracted civil war in England that lasted nearly twenty years. Adela retired to Marcigny Convent in 1120. Though she may have considered retiring to an abbey in Normandy, where members of her family, including sisters and nieces, may have already been living; Adela was drawn to and chose the larger, more prestigious convent at Marcigny near her son Henry at Cluny Abbey. Adela may have acted as prioress within the community at Marcigny, though this is not certain. She continued to interact with her children and the ecclesiastical leaders of lands that she had once ruled, communicating with them and maintaining her influence over the area. In one instance, Adela sent letters to both her son Thibaud  and Geoffrey, bishop of Chartres reminding them of her settlement of a monastic case. In these letters she reminds her son how his father and herself felt about alms gifting to monasteries. Later that same year, her daughter Lucia-Mahaut, was drowned in the wreck of the White Ship alongside her husband. Adela lived long enough to see her son Stephen on the English throne, though any response she had to this development has been lost. She likely took pride in the ascension of her youngest child, Henry of Blois, to the bishopric of Winchester in 1129. She died in 1137 at Marcigny. After her death, prayers were offered at a number of churches that she had endowed personally or had recognized at some point during her life. With her money and influence, and later entry into the convent, Adela became a saint within the Catholic Church. Adela and Stephen's children are listed here in probable birth order. Their birth order is uncertain. Lucia-Mahaut, married Richard d'Avranches, 2nd Earl of Chester. Both drowned on 25 November 1120 in the White Ship disaster. Some of the daughters may have been step-daughters of Adela, rather than biological children. It is known that Adela had five biological sons and may have had three or more daughters, though not all of the daughters were necessarily Adela's biological children. The daughters are not mentioned by name during their youth, only appearing when they reached marriageable age and played an important part in building alliances. Adela is a saint in the Roman Catholic church. Her feast day is 24 February. Adela was portrayed by Nike Arrighi in the two-part BBC TV play Conquest (1966), about her father's conquest of England, part of the series Theatre 625. Adela is a featured figure on Judy Chicago's installation piece The Dinner Party, being represented as one of the 999 names on the Heritage Floor. ^ a b c d LoPrete, Kimberly. "Adela of Blois." Women and Gender in Medieval Europe: An Encyclopedia. Ed. Margaret Schaus. New York: Routledge, 2006. 6–7. ^ a b Catholic Online. "St. Adela". ^ LoPrete, Kimberly A. "The Anglo-Norman Card of Adela of Blois." Albion: A Quarterly Journal Concerned with British Studies 22, no. 4 (1990): 569–89. doi:10.2307/4051390. ^ LoPrete, Kimverly A. "The Anglo-Norman Card of Adela Blois." Albion: A Quarterly Journal Concerned with British Studies2, no.4 (1990): 569–89. JSTOR. ^ Daniel. "Robert Curthose, Duke of Normandy (c.1050–1134), by William M. Aird Adela of Blois: Countess and Lord (c.1067–1137), by Kimberley LoPrete | The English Historical Review | Oxford Academic." OUP Academic. December 01, 2011. Accessed April 26, 2018. ^ a b LoPrete, Kimberly A. (1990). "The Anglo-Norman Card of Adela of Blois". Albion: A Quarterly Journal Concerned with British Studies. 22 (4): 569–589. doi:10.2307/4051390. JSTOR 4051390. ^ LoPrete, Kimberly A. "Adela of Blois as Mother and Countess." Medieval Mothering. Ed. John Carmi Parsons and Bonnie Wheeler. New York: Garland Pub., 1999. 315–316. ^ Evergates, Theodore, and Kimberly A. LoPrete. "Adela of Blois: Familial Alliances and Female Leadership." Aristocratic Women in Medieval France, 1999, 8–43. Accessed March 19, 2018. Muse. ^ a b c d e f g h i LoPrete, Kimberly A. "Adela of Blois: Familial Alliances and Female Lordship." Aristocratic Women in Medieval France. Ed. Theodore Evergates. Philadelphia: University of Pennsylvania, 1999. 15. ^ Evergates, Theodore, and Kimberly A. LoPrete. "Adela of Blois: Familial Alliances and Female Leadership." Aristocratic Women in Medieval France, 1999, 8–43. Accessed March 19, 2018. ^ "A letter from Count Stephen of Blois (03/1098)". ^ "Adela, countess of Blois, Chartres, and Meaux". ^ LoPrete, Kimberly A. Adela of Blois: Countess and Lord (c.1067–1137). Dublin: Four Courts, 2007. 115. ^ Daniel. “Robert Curthose, Duke of Normandy (C.1050–1134), by William M. Aird Adela of Blois: Countess and Lord (C.1067–1137), by Kimberley LoPrete | The English Historical Review | Oxford Academic." OUP Academic, Oxford University Press, 1 Dec. 2011, academic.oup.com/ehr/article/CXXVI/523/1498/673178. ^ LoPrete, Kimberly A. "Adela of Blois as Mother and Countess." Medieval Mothering. Ed. John Carmi Parsons and Bonnie Wheeler. New York: Garland Pub., 1999. 322. ^ LoPrete, Kimberly A. "Adela of Blois as Mother and Countess." Medieval Mothering. Ed. John Carmi Parsons and Bonnie Wheeler. New York: Garland Pub., 1999. 318-19. ^ "A Letter from Adela." A Letter from Adela | Epistolae. Accessed April 26, 2018. https://epistolae.ctl.columbia.edu/letter/25996.html. ^ LoPrete, Kimberly A. Adela of Blois: Countess and Lord (c.1067–1137). Dublin: Four Courts, 2007. 111. ^ Reporter, Laura McCallenChief. “Who Was Adela of Normandy?” Royal Central, 6 Oct. 2016, royalcentral.co.uk/blogs/who-was-adela-of-normandy-69264. ^ LoPrete, Kimberly A. Adela of Blois: Countess and Lord (c.1067–1137). Dublin: Four Courts, 2007. 412. ^ LoPrete, Kimberly A. Adela of Blois: Countess and Lord (c.1067–1137). Dublin: Four Courts, 2007. 412–418. ^ "A letter from Adela, Countess of Blois, Chartres, and Meaux (1133–37)". ^ A Letter from Adela, Countess of Blois, Chartres, and Meaux (1133–37)." A Letter from Adela, Countess of Blois, Chartres, and Meaux (1133–37) | Epistolae. Accessed April 26, 2018. https://epistolae.ctl.columbia.edu/letter/77.html. ^ LoPrete, Kimberly A. Adela of Blois: Countess and Lord (c.1067–1137). Dublin: Four Courts, 2007. 416. ^ "Adela, Countess of Blois, Chartres, and Meaux". Epistolae. Columbia University. Retrieved 27 September 2016. ^ LoPrete, Kimberly, Adela of Blois. Four Courts Press, Dublin. 417–418. ^ Patron Saint Stories, Stories of Patron Saints for Baptismal Names. Accessed April 24, 2018. https://www.patronsaintstories.com/adela. ^ Senette, Douglas John. "A Cluniac Prelate: Henry of Blois, Bishop of Winchester (1129–1171)". Tulane University Digital Library. Retrieved 27 September 2016. ^ "Adela of Blois". Elizabeth A. Sackler Center for Feminist Art: The Dinner Party: Heritage Floor: Adela of Blois. Brooklyn Museum. 2007. Retrieved 15 December 2011. ^ Carpenter, David (2004). The Struggle for Mastery: The Penguin History of Britain 1066–1284. New York: Penguin. pp. 531–532. ISBN 0-14-014824-8.